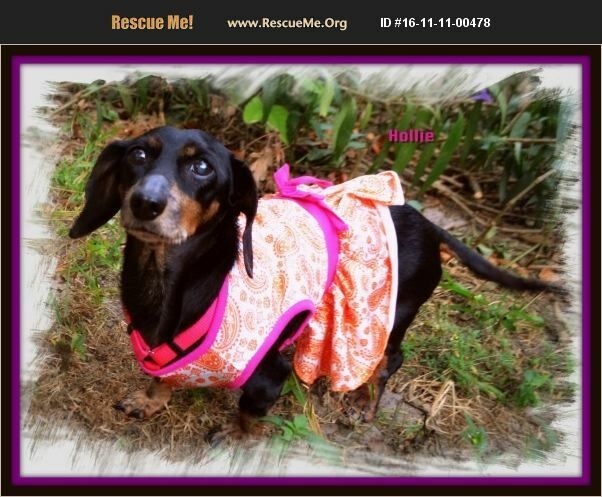 GetALong Dachshund Rescue is proud to present Hollie. This sweet girl is 12 years old, spunky, and yet easy going. A perfect 13 pound little gal who finds joy in everything, she is very sweet, gentle, well behaved. Hollie is house trained but like all dachshunds she will need to be confident in her environment to have good potty habits. All rescue dogs go thru a period of adjustment so understanding and patience is important. Hollie came into rescue while undergoing an episode of IVDD, and although well recovered, it is important that Hollie not be allowed to jump off and on furniture nor use stairs. Hollie is perfectly fine having limited (but monitored!) run of the house for a few hours a day, but it is best she be confined to an area with carpeting so she won't slip or in a crate. Hollie loves being walked, and gets VERY excited about sniffing things and exploring her environment. She is crate trained, and LOVES her crate (with her toys)in her foster home in Florida. Hollie gets along fine with other dogs and cats but people are her favourite companions and cuddle mates. Hollie knows a few basic commands and will 'sit' on command. This beautiful senior girl is searching for a home to spend her days with love and joy. She is waiting just for you!